Perhaps one of the perpetual cycles that NHL teams struggle most with is alternate jersey designs. Even when a team has a great one, something seems to crop up that causes them to change their threads. As you may or may not remember, the third jersey craze really heated up in the 1995-96 season and has since skyrocketed to a perpetual cycle for most of the teams throughout the league. Not every team has a third jersey in active service, but most teams utilize some option as an alternate or for special occasions. I base my preference of third jerseys off a handful of criteria which I have used to make a definitive ranking of the NHL’s alternate uniforms. A third jersey should offer a few specifics. First, proper use of the team’s color palette is a must. I prefer taking a complimentary color and using it as the jersey’s base. Second, using a different pattern than the primary uniforms is always nice. There isn’t much point in adding another traditional looking jersey to a pair that looks almost identical to it. Preferably a team with a more modern jersey set would go with a traditional design whereas a team with a traditional design would go in the other direction. The lone exception here is if a team goes with a full throwback style, typically those fit in well regardless of the team’s typical look. Finally, I like having the primary crest as a secondary and using a secondary crest as the primary. After all, most shoulder patches are a team’s alternate logo. Using the primary works just fine, but well done alternate logos are high on my list. What tends to happen is that some alternate crests don’t translate on a larger scale, which detracts from the jersey’s overall look. 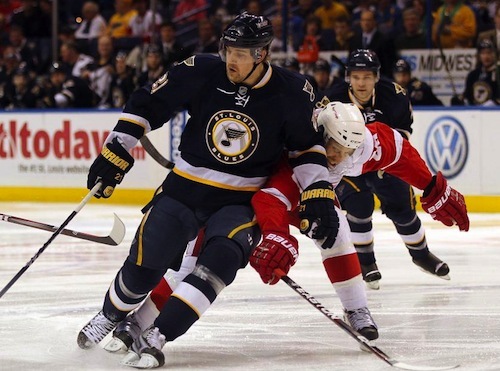 St. Louis Blues: A perfectly executed alternate jersey. This takes a complimentary color and uses it as a primary, it gives a traditional take to a team with a more modern design standard and the circular crest is awesome. Full marks. Ottawa Senators: Like the Blues jersey, this offers a different, more traditional design standard when compared to the regular home and away jerseys. The crest couldn’t be any better and the whole jersey looks terrific. San Jose Sharks: The black and teal work too well together for this not to rank high on the list. A great, understated jersey that fits perfectly within the team’s identity; another important factor to consider with a third jersey. 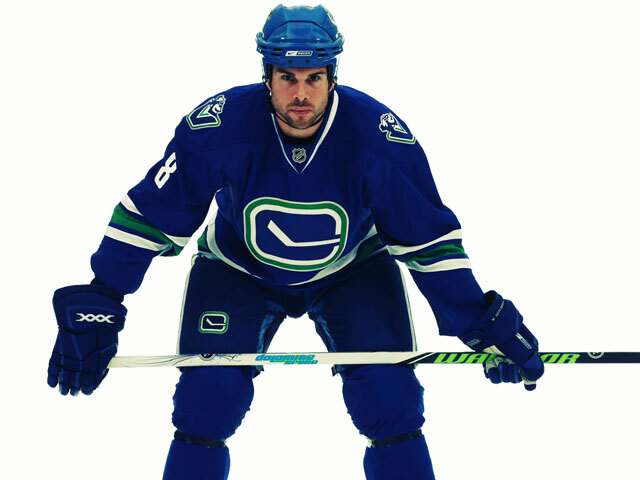 Vancouver Canucks: The first retro jersey on the countdown, Vancouver went with a complimentary design as opposed to one that stands out from their traditional jerseys. For a team that has so widely embraced that M.O., this jersey fits perfectly with their uniforms. Washington Capitals: Slotting in at five thanks to the nostalgia factor, these duds are a great throwback jersey that holds steady with the team’s current standard while taking everyone back by a few decades. New York Rangers: The New York vintage third jersey looks great. The traditional striping pattern works well with the team’s design standards. While the Lady Liberty jerseys will always be my favorite, these still look great. The vintage white does it for me. 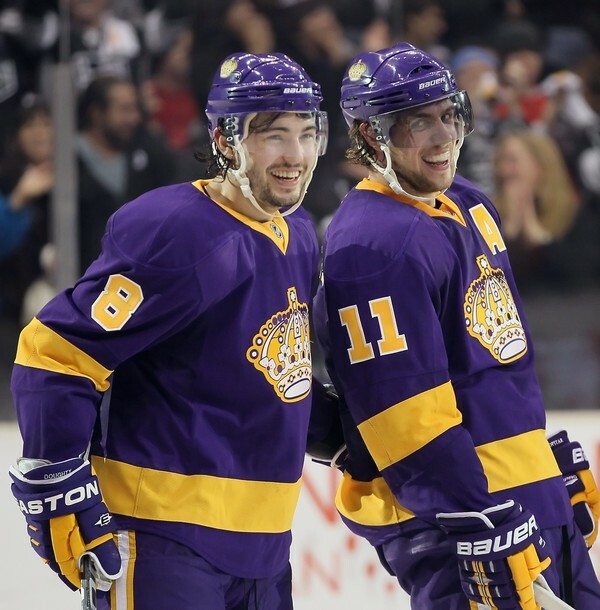 Los Angeles Kings: The Kings may deserve an asterisk here since they seem to be slowly doing away with their alternate jerseys. While this doesn’t meet many of the rules I set for proper third jersey design, the traditional throwback is a clear exception to the rule. Turning back the clock (like the Flames previous thirds) is an auto win for me because there is no way to screw them up. Minnesota Wild: The best overall set of uniforms in the league boasts one of the best third jerseys. While I think the crest leaves something to be desired, the overall design here looks awesome. Toronto Maple Leafs: Not much to see here, a throwback inspired jersey that looks great. It also looks a hell of a lot like their homes, so there isn’t much to judge. Phoenix Coyotes: Perhaps a surprise this high on the list, I love Coyotes alternates. The sand colored numbers, leaping Coyote and alternative striping pattern all work very well together. It offers a different look than the primary design even with a change in the crest, which can be a no-no. Colorado Avalanche: A blue version of their ultra-classy burgundy thirds from the early 2000s. While these certainly look nice, I’m not all that taken with them. Carolina Hurricanes: Alternate logos can be tricky if they’re overdone, but Carolina (and Phoenix for that matter) do a great job with theirs. The black-on-black shoulder patch and storm flag waist stripe are a little over the top in my opinion. Anaheim Ducks: What I like about this jersey is that they use the webbed-D as opposed to the out-of-place Ducks wordmark. What I don’t like it how the orange is incorporated. They get credit for not going orange with these – it just would’ve been too much to handle – but the way they incorporated it just doesn’t work for me. Not an appealing look. Boston Bruins: Holy vanilla, Batman. I don’t think the Bruins jerseys could get more boring than they currently are. I was a huge fan of the Pooh Bear thirds from the 90s and these are just so plain. No waist stripes hurt and I’m not sold on this particular alternate logo as a crest. 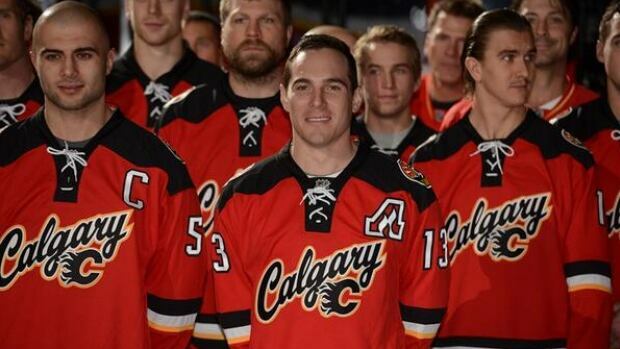 Calgary Flames: The shoulder patch on these jerseys is so awesome. But the rest is just bad. It reminds me of a beer league softball jersey. Their throwback alternates were so perfect that these really pale in comparison. 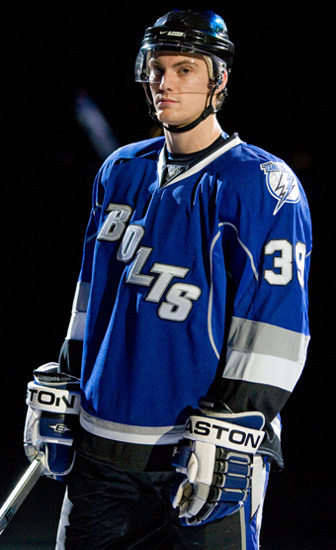 Tampa Bay Lightning: The Bolts wordmark really hurts these jerseys. I like the change in the design standard and the blue base looks cool. But the crest is out of place. Columbus Blue Jackets: The color scheme looks amateurish to me. I think they went overboard with the off-white everywhere and it doesn’t translate well to the design. The pattern would be cool, but the color choices and that horrible crest really set this uniform back. 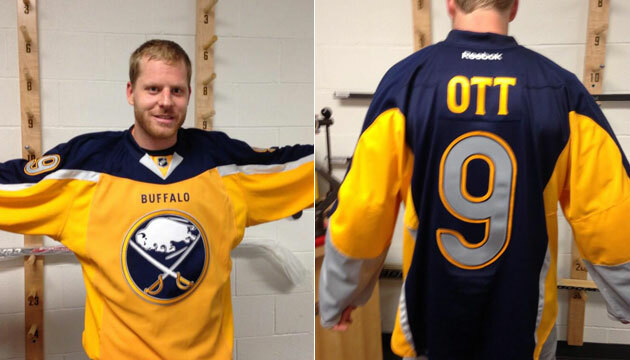 Buffalo Sabres: This abomination has earned plenty of enemies in Buffalo since it was unveiled. Blame the cape-effect you get from the two-toned pattern. Don’t forget the grey number (why?) and oddly placed silver accents. They were on the right track with yellow, everything else is a miss. New York Islanders: Amazingly I still slot the Isles jerseys behind Buffalo’s new alternates. There is no black in the Isles color scheme. The baseball-style team name looks bad and the number actually overpowers it on the front of the jersey. Add in the odd choice of grey and this thing is a train wreck. A pair of very familiar faces are back in prominent positions with the Sabres organization as Pat LaFontaine and Ted Nolan were brought back in the fold after a massive shake up at First Niagara Center. LaFontaine takes over as the team’s President of Hockey Operations with Ted Nolan stepping in as the interim head coach. Both Ron Rolston and Darcy Regier were relieved of their duties prior to LaFontaine and Nolan stepping in. Ousting Rolston seemed like an inevitable choice given Buffalo’s woeful record and the ugly way they went about earning it. Exactly when the axe was to fall on Rolston was left to guesswork due to Buffalo’s current campaign for the first overall pick. The heat was rising fast, however, as Buffalo’s string of first period flops and ugly losses was punctuated by an inability to draw any sort of redemption from the progression of the team’s young players. When a coach lauded for his ability to develop players isn’t even doing that, obviously there is a problem. Regier’s departure is only shocking when you consider the scope of this shakeup. The construction of the roster left plenty to be desired and his quest to mimic the toughness of the Bruins ended up sacrificing the overall skill level of Buffalo’s forward group. Like Rolston, Regier’s departure was something that was expected at some point in the coming calendar year, the timing is what comes as something of a shock, as were his replacements. Pat LaFontaine strikes me as a solid, sound choice as the team’s new President of Hockey Operations. His lack of front office experience doesn’t make him a glowing candidate for the position of GM and he said as much during today’s press conference. What LaFontaine brings is a fresh set of eyes to evaluate and hire the general manager who will guide the team through this rebuilding process. His choice on the new GM will have a trickle-down effect on the team’s current interim head coach, Ted Nolan. The interim tag given to Nolan indicates that the new GM will have the ability to make the final choice on the coach and should the two not see eye-to-eye, the GM will be able to replace him. Given that the chain of command has yet to be completed, this makes a lot of sense. Nolan’s success could certainly dictate whether or not he drops the interim tag, but there is no doubt that the new GM will have final say on his tenure this time around. Given that LaFontaine is ensuring the new chain of command falls as it should, I’m not reading too much into Nolan’s hiring at this point. In fact, I’m willing to wait to not only see who the new GM will be, but what his choice of head coach will wind up being. At that point it will be slightly easier to pass judgement. Nolan will simply be keeping the seat warm for the time being with the opportunity to earn a full time role should he prove capable. This decision also allows the Sabres to continue forward with a clean slate. There was a growing trend of negative comments made about the culture in Buffalo – namely from Jordan Leopold, Andrej Sekera and even Jason Pominville. What they were specifically referencing can’t be confirmed as they could just as easily have been referring to the entire hockey department or just the attitudes in the locker room. No matter where it stemmed from, there certainly seemed as if there was a recruiting problem at First Niagara Center; starting fresh in the hockey department should aid in erasing that stigma. By cleaning house, Terry Pegula and his staff are taking strides to eliminate any sort of negative perception that had become attached to the organization under the Regier’s regime. That may serve as the most important aspect of this decision. Not only is LaFontaine a familiar face and Sabres legend, he has no connection to Regier’s management team. In fact, there are indications that LaFointaine (and Nolan to an extent) wouldn’t have returned has Regier stuck around. So clearly there was some disconnect between how Regier operated and how it was embraced league-wide. With LaFontaine clearly separated from that modus operandi, there should be some positive results when recruiting a new general manager, coach and perhaps even free agents. That’s not to say that hiring LaFontaine will magically make every free agent want to play in Buffalo, but I have to think it will give them more confidence than they may have had in a GM who held his post for nearly two decades. The long term results of this hiring won’t even begin to bear results for some time. But the time for a drastic change at the top of the Sabres hockey department seemed to be long overdue. Today marked a big first step forward with the next step hopefully to come soon in the form of a new GM. A rash of suspensions handed down from the NHL’s Department of Player Safety in a response to a ridiculous number of illegal checks through the first month of the NHL season has been the primary focus of fans and media members alike. John Scott’s elbow to Louis Ericsson’s head was the exclamation point on a two-week span that saw a handful of ugly hits and somewhat lengthy suspensions doled out as punishment joined Pat Kaleta as the sole set of teammates on the list of suspended players and the combined games between the two illustrates the need for more strict policing both on and off the ice. The worst side effect from these hits – outside of the media circus they often spark – is the long-term effects that players will suffer from repeated head injuries. With all the steps the NHL has taken in an attempt to curb head contact and dangerous concussions, it’s hard to say what type of effect the recent legislation has had. Companies like Bauer, CCM, Easton and Warrior who each have a major claim in the helmet market have each taken strides to introduce technologically advanced helmets with features designed to help reduce the chances that a concussion will occur. The Bauer RE-AKT is the current trail blazer in this category as the Suspend-Tech liner introduces a padded liner designed to move independently from the helmet shell; thus limiting the chances that a jarring blow to the shell will cause the head and brain to react in a similar manner. Interestingly enough, one of the most effective helmet designs with concussion prevention in mind was the M11 helmet that was on the market recently. Bauer has taken over the line and is utilizing the Seven technology in their new IMS line. However, in the NHL at least, these technologically advanced helmets aren’t the norm. Many professionals choose to go the comfortable route with a VN Foam liner in their helmet. That isn’t to say that a player’s choice in helmets has anything to do with keeping them free from concussions, but the use of old technology can’t be helping, either. Football and hockey have both shown that no matter what type of helmet you’re using that jarring collisions that cause the head to be shaken or rattled in a violent matter will likely lead to some concussion-like symptoms. Even on plays without head contact, violently altering a body’s motion has the ability to cause a concussion due to the whiplash effect. Preventing head injuries is ultimately on the onus of the players. At the youth and professional levels, the responsibility falls on the participants to avoid dangerous hits, slow down when they see their opponents numbers and be smart when lowering a hit. Not one of the hits that led to a suspension in the NHL this year showed any sort of caution or care for the opponent. In a sport as physical and competitive as hockey this isn’t necessarily a surprise. However, the reckless actions that were taken by John Scott, Cody McLeod and Maxim Lapierre could have been easily prevented had the player processed what they were doing prior to leading with their elbow or throwing their opponent into the boards head first. Goons, enforcers and grinders aren’t the lone culprits here either. Skill players who get away with taking liberties due to their status is a trend that cannot continue. While the physical force of the game isn’t likely to be drastically changed anytime soon, longer suspensions for violators in these cases will continue to serve as the deterrent for these plays. He’s the major piece in the first major blockbuster of the NHL season. Thomas Vanek was shipped to Long Island on October 27 and has plenty of new gear on his hands now that he’s suiting up with the Islanders. Here’s a look at the products that Vanek’s wearing this season. Vanek, when he’s not using Warrior, is using CCM. He graduated to the RBZ this season after wearing the U+ for the last year or two. Vanek is a sneaky quick player who happens to spend a lot of time in front of the net. He needs a tough, durable skate that’s lightweight and the RBZ meets each and every one of those requirements. Warrior’s Franchise line may be the favorite among most players, but the Covert is a very close second. A glove with an anatomic build, the Covert offers a snug fit and excellent responsiveness. Exactly the type of glove a sniper like Vanek would want. Yet another pro who prefers the traditional VN foam liner to than of the more technologically advanced helmets that are on the market. A number of years ago Vanek was sporting the old Mission Intake before changing over to the CCM in the past few years. It’s hard to argue as the CCM helmet line passes the comfort, protection and mirror tests with ease. Vanek’s Oakley visor is the Pro Straight small. It’s a slightly scaled down version of Oakley’s Pro Straight with a small indent along the bottom edge. It’s not a notch or even curve, but simply a small change of height (more or less) that allows for a very nice field of vision. If there’s one thing to be said about Vanek it’s that he’s a brand loyal guy. Aside from changing up his helmet brand, he’s been using nearly the same thing for about half a decade. Aside from graduating to new models each year, Vanek has been scoring piles of goals with Warrior sticks dating all the way back to the Dolomite. He’s now sporting the Covert taking advantage of the Dagger Taper technology and Warrior’s growing reputation for building some of the game’s best sticks. It’s hard to make out, but it does appear that Vanek is rocking Warrior’s Covert pant based on the Velcro on the inner thigh. However, it’s just as likely that he’s using an Islanders shell while continuing to use his Sabres pants. If that’s the case he could be in anything from a Warrior Hustler to even another company’s pant. Leave a comment for us below on some players you’d like to see profiled in the What They’re Wearing section.